The 5000 DWT Flettner freighter has been developed within the European “SAIL” project. An important outcome of the project is that due to the dependence on trade winds, a 100% sailing vessel without an engine is not economically feasible within the commercial cargo transport sector. Broad research has been done to generate viable alternatives, leading to the model of wind assisted propulsion and hybrid shipping. The Flettner Freighter has a water displacement of nearly 8,000 tons and 6320 m3 cargo capacity. Furthermore, the ship is equipped with one main engine of 4000 kW and has a service speed of 13 knots when loaded. The Flettner Freighter is using four modern Flettner Rotors (designed by Anton Flettner in 1928). The Flettner Rotors create a forward lift by the rotation of the rotors and the wind. On average, the use of the Flettner Rotors results in a fuel saving of at least 18%, compared to conventional cargo vessels in the same DWT range. The main innovation of the Flettner Freigher is the possibility to move the rear two Flettner Rotors in the longitudinal direction to accommodate for the best sail balance of the vessel and thus to optimally exploit the wind force and wind direction. SAIL is an international cooperation in the European Interreg IVB North Sea Region under the leadership of the Dutch Province of Friesland and ends in 2015. The Flettner Freighter was developed in cooperation with a shipowner and is designed by C-Job Naval Architects. 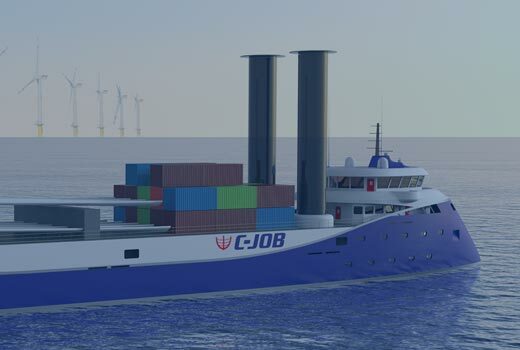 C-Job is known for earlier innovative ship designs, such as the green ferry MS. Texelstroom for TESO NV and the series of Heavy Lift Vessels for Hartman Shipping and Abis Shipping. 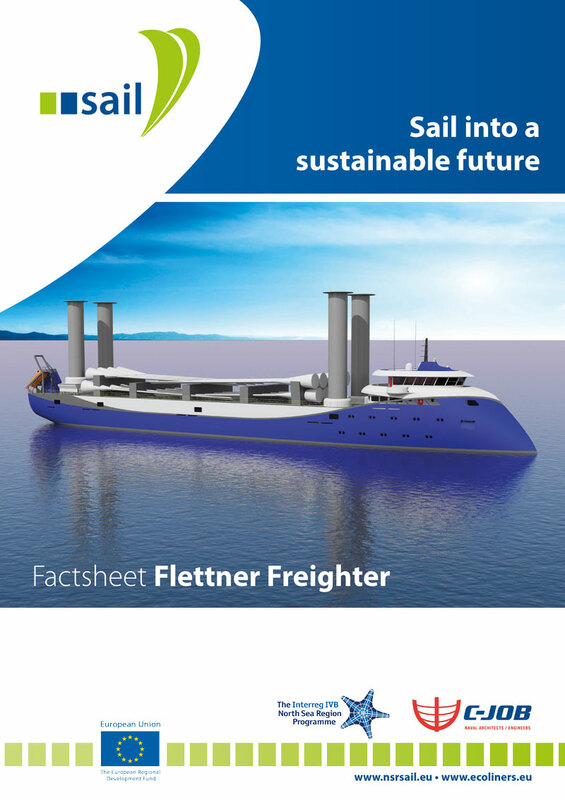 The ambition of the SAIL project partners is to enrich commercial shipping with innovative and sustainable vessels such as the Flettner Freighter. To learn more about the Magnus Effect, watch this video. Find more information on the Flettner Freighter in this Factsheet. Click on the image to download. 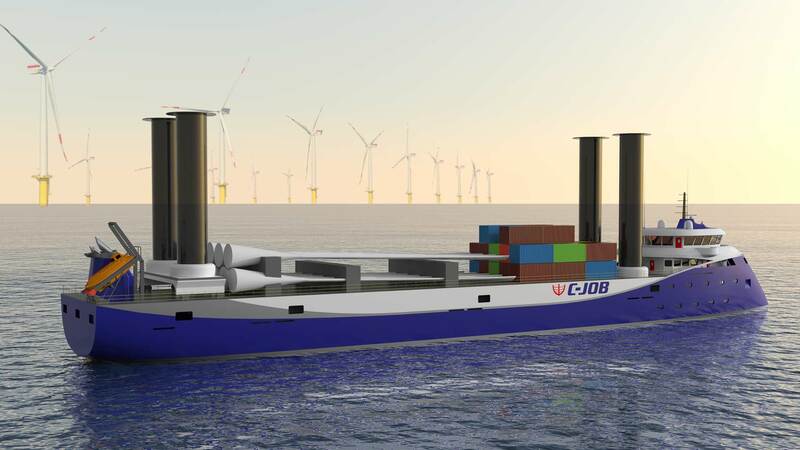 C-Job Naval Architects has just delivered a concept design to Switijnk Shipping that shows that, in order to speed the process of sustainability, some shipping companies are taking the matter into their own hands.